A poor translation of a Dutch saying. Oxygen is the devil. For wine. For everything. Rust. Rotting. Fires. All caused by oxygen. Oxygen is not all bad. I would not know what to do without it. But for wine and beer it is not very good. This is not very accurate because oxygen is important for yeast to multiply in the first stage of fermentation. Yeast can create more energy with oxygen. After this, oxygen becomes harmful for wine and beer. And even that is not completely true. As you may know a little bit of air travels through cork letting the wine mature very slowly. Tannin becomes softer and lots of reactions take place. We have just a slight idea of what is happening. Wine still improves under the influence of oxygen. Can we finally end this love story for oxygen? Well almost. Really. A young red wine can age rapidly by pouring it in a different container. If google translate is correct the term is carafe. By adding oxygen aroma’s are formed and the wine improves dramatically. And here the positive ends. Let’s decant. Or perhaps not. Decant is also pouring wine in a different container. But the goal is different. Old wines may have some deposit in the bottle which you don’t want in your glass. The purpose is to pour the wine very carefully in a decanter, leaving the deposit, and minimizing the contact with oxygen. You should do this just before drinking the wine. If necessary because this procedure may destroy wine in minutes. I believe that this is often a bit exaggerated. Yeast uses oxygen and creates a protective blanket of CO2 lying on the wort or most. (CO2 is heavier than air) Close the bucket or demijohn and leave it. Do not measure S.G. or check it every day because you will destroy your blanket! Oxygen is an important cause for oxidation and that is why sulphite is used. It reacts with oxygen before it affects the wine. When used in wine everybody has an opinion. It gives headaches, is unnatural, and chemical. It is also used when conserving raisins and I never heard anybody complain about headaches from raisins. Beer, and wodka? Yes. But they do not contain sulphite. And unnatural? During fermentation yeast form sulphite itself. It is impossible to make a wine that is completely free of sulphite. To show the point of sulphite I did a little test. 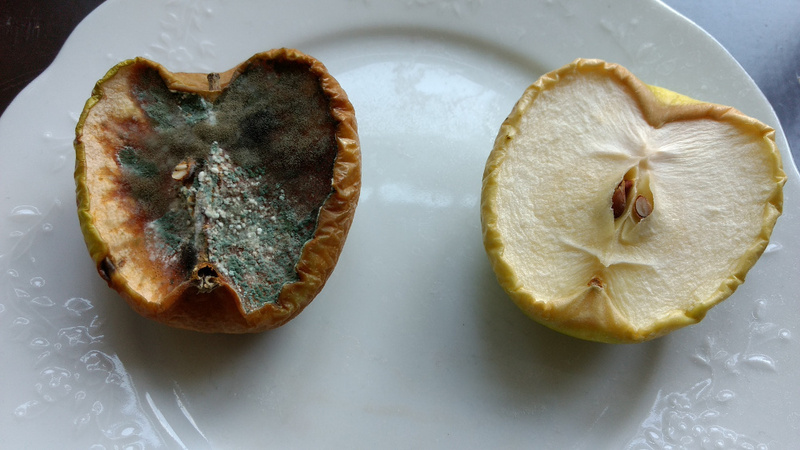 I cut an apple and gave one half a sulphite bath. The pictures are quite clear. Apple juice from the supermarket is pretty brown. Fresh apple juice is not. I am not sure but this seems to indicate a little oxidation. Personally I am not against using a little sulphite. The advantage of being a hobby wine maker is that you do not risc a fortune. In the worst case you have to throw away 25 liter. Not very nice but you will not be bankrupt. Obviously this is different for big wineries. They are allowed to use up to 7 times what a hobby maker thinks is sufficient. I never lost a wine because it turned bad. Wine is good at protecting itself creating an acidic, alcoholic environment. I am not sure of the necessity of sulphite. I have made wine without it and there was no problem with it. But I do believe that it does more good than bad. P.S. Visit the shop Leven in de Brouwerij. This entry was posted in Beer, Wine. Bookmark the permalink.